As we settle into the middle of winter, things are cooling off here in New Braunfels. That doesn’t mean we at Legacy AC and Heating and Air Conditioning can cool our heels, our work schedules are just heating up! That’s because we’re getting lots of calls about our HVAC services and our work on heat pumps and furnaces. New Braunfels is fortunate to experience fairly mild winters, meaning that our air conditioners work harder than our heaters do. But when it comes to heating your home during the colder months, you might be faced with a choice; is a heat pump or furnace better for your home? How Do These Systems Produce Heat? While both systems have the same end result, a warm house, how they achieve that result is distinct. Furnaces work by burning oil or natural gas. The heat is pushed up and out of the furnace and into the home via the ducts of your HVAC system. Some furnaces make use of electricity as well. Heat pumps, on the other hand, do not rely on a fuel source. Rather, heat pumps make use of electricity, and interestingly, refrigerant to create warm air in the house. Basically, heat pumps are air conditioners in reverse. Air is drawn from the outside and pumped into your home. As the rising costs of fossil fuels becomes of more pressing concerns to homeowners everywhere, many residents are interested in finding HVAC systems that are highly efficient. This means that their utility bills are lower, and that they’re saving more money. Furnaces have long had a reputation for being inefficient, but that has changed with recent advances in technology. Now, furnaces are up to 98 percent efficient. This means that only two percent of the fuel the furnace uses to create heat is allowed to escape with the combustion fumes that are vented outside of the house. Heat pumps are valued because of their highly efficient nature. The lack of a combustible fuel source and reliance on electricity mean that heat pumps can be up to 300 percent efficient. That means that for every one unit of electricity used to power the pump, it can produce three units of heat energy. While this sounds great, that high level of performance can falter in exceedingly cold temperatures. That means on those particularly icy days, you’ll have to rely on a furnace anyway in order to keep your home nice and toasty. The most obvious advantage of using a heat pump over a traditional furnace is the energy efficiency. Heat pumps use electricity more efficiently than a furnace uses natural gas. However, that doesn’t necessarily mean it’s cheaper. Electricity often costs more than natural gas. Of course, heat pumps are also ideal for those who do not have natural gas lines running to their home. They are also perfect for homeowners who are considering replacing their air conditioner, as a heat pump can essentially fulfill both roles. Furnaces can heat your home in any temperature throughout the year. Furnaces generate heat, rather than move it from the outside in. In terms of cost, a new furnace is often significantly cheaper than a new heat pump. However, furnaces are not without their faults. The cost of fuel for your furnace can get out of hand quickly if it is used often. Similarly, if you do not have access to natural gas, you may not be even able to use your furnace anyway. Which Is Right For New Braunfels? 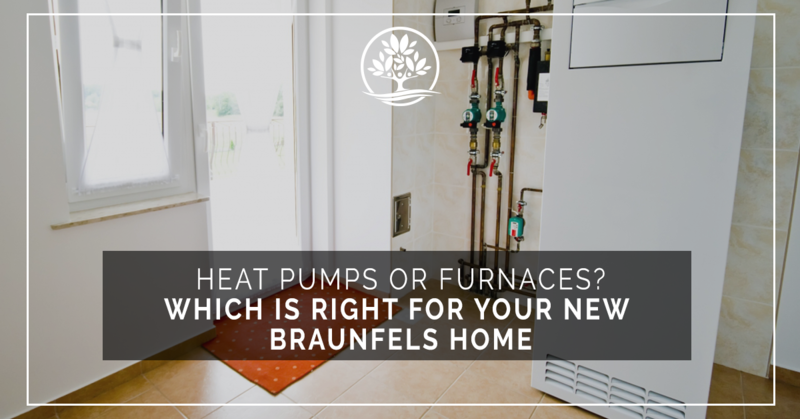 With decades of experience in the HVAC field, we’ve found that heat pumps are ideal for the beautiful New Braunfels climate. Since they can double as an air conditioner, this one unit can do two jobs for the price of one. The mild winters mean that its rare that outside temperatures dip below 40 degrees Fahrenheit, meaning that your heat pump will never struggle to keep up with its heating duties. In need of a new heat pump or other HVAC services in New Braunfels? We’re your Top Rated Local® HVAC service provider! With our attention to detail, free quotes, and 24-hour HVAC services, Legacy Services makes it easy to keep your heat pumps, air conditioners, and more working smoothly. Contact us today!